This article is about the ninth-century Bishop of Rome. For the Coptic Pope Theodore II elected in 2012, see Pope Tawadros II of Alexandria. Pope Theodore II (Latin: Theodorus II; 840 – December 897) was pope for twenty days in December 897. His short reign occurred during a period of partisan strife in the Catholic Church, which was entangled with a period of feudal violence and disorder in central Italy. His main act as pope was to annul the "Cadaver Synod" of the previous January, therefore reinstating the acts and ordinations of Pope Formosus, which had themselves been annulled by Pope Stephen VI. He also had the body of Formosus recovered from the river Tiber and reburied with honour. He died in office in late December 897. Towards the end of the ninth century, due to the collapse of the Holy Roman Empire the Catholic Church had to rely upon powerful European nobles for support. Pope Stephen V approached Arnulf of Carinthia to protect Rome from "pagan and evil Christians". After he refused, Stephen V had to rely upon Guy III of Spoleto instead. Guy agreed to protect Rome as long as he was named as the Holy Roman Emperor, to which Stephen V acceded. After Stephen V's death, Pope Formosus was elected. Formosus and Guy were reluctant allies, and Guy forced Formosus to crown him emperor again and to name his son, Lambert, as co-emperor and successor. Formosus did so, but after Guy's death, he lobbied Arnulf to rescue Rome from the Spoletans. Arnulf agreed, and Formosus subsequently appointed him as the Holy Roman Emperor in 894. Both Arnulf and Formosus died within a few years of the coronation, and the new pope, Stephen VI, crowned Lambert as the new emperor shortly thereafter. In January 897, Stephen VI held what is known as the "Cadaver Synod". He had the body of Formosus exhumed from St. Peter's Basilica and dressed in pontifical vestments. 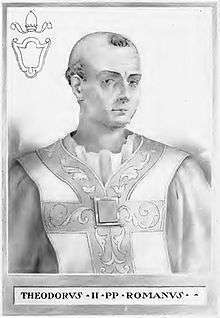 The dead pope was charged with "perjury, violating the canons prohibiting the translation of bishops, and coveting the papacy." Formosus' defence was provided by a deacon, but he was found guilty of all the charges. The synod annulled all of Formosus' acts and ordinations. Formosus' body was reburied in a common grave, and then thrown in the river Tiber. Supporters of Formosus rebelled, and seven months after the synod, Stephen VI was deposed, and died soon after in prison. His replacement, Pope Romanus is generally assumed to have been pro-Formosus, but he was only pope for four months before he was deposed and made a monk. Little is known of Theodore's background; he is recorded as being born a Roman, and the son of Photios I of Constantinople, who was the Patriarch of Constantinople. His brother Theodosius (or Theosius) was also a bishop. He was ordained as a priest by Stephen V. The exact dates of his papal reign are unknown, but modern sources generally agree that he was pope for twenty days during December 897. Flodoard, a tenth-century French chronicler, only credited Theodore with a twelve-day reign, while in his history of the popes, Alexis-François Artaud de Montor listed Theodore's reign as being twenty days, from 12 February to 3 March 898. Flodoard cast Theodore in a positive light, describing him as "beloved of the clergy, a friend of peace, temperate, chaste, affable and a great lover of the poor." He died in office, though the cause of his death is unknown. In her book The Deaths of the Popes, Wendy Reardon suggests that Theodore "died suddenly from unknown 'foul play' (most likely poisons)". Horace Kinder Mann offers a different suggestion in his papal history, noting that it is possible that Popes who were "infirm or even older than [...] their predecessors" might have been elected intentionally. Theodore was buried at St. Peter's Basilica, but his tomb was destroyed during the demolition of the old basilica in the seventeenth century. After Theodore's death, both Pope John IX and Sergius III claimed to have been elected pope; the latter was excommunicated and driven from the city, though he did later become pope in 904. John IX held synods reaffirming that of Theodore II, and he further banned the trial of people after their death. In turn, Sergius III later annulled the synods of Theodore II and John IX, and reinstated the validity of the "Cadaver Synod". ↑ "Scs. Petrus" stands for "Sanctus Peter", the first pope, while "Thedr." was an abbreviated form of Theodore. ↑ Dollison (1994), p. 95. ↑ Kelly, Walsh (2010), pp. 113–14. ↑ Kelly, Walsh (2010), p. 114. ↑ Kelly, Walsh (2010), pp. 114–15. 1 2 3 4 5 6 Mann (1902), pp. 88–90. 1 2 3 4 5 Kelly, Walsh (2010), p. 115. ↑ Gregorovius (2010), p. 230. ↑ Artaud De Montor (1911), pp. 119–20. ↑ "Theodore II – A 20 Day Reign". Sts. Martha and Mary Parish, Mississauga. 3 December 2006. Retrieved 16 September 2015. 1 2 Reardon (2004), p. 68. ↑ Kelly, Walsh (2010), p. 116. ↑ Kelly, Walsh (2010), pp. 118–19. Artaud De Montor, Alexis-François (1911). The Lives and Times of the Popes. New York: The Catholic Publication Society of America. OCLC 388047. Dollison, John (1994). Pope-Pourri: What You Don't Remember From Catholic School. New York: Fireside. ISBN 0-671-88615-0. Mann, Horace K. (1910). The Lives of the Popes in the Early Middle Ages. London: Kegan Paul, Trench, Truebner, & Co. Ltd. OCLC 499626370. Reardon, Wendy J. (2004). The Deaths of the Popes. Jefferson, North Carolina: McFarland & Co. ISBN 978-0-7864-6116-5. Mann, Horace Kinder (1912). "Pope Theodore II". In Herbermann, Charles. Catholic Encyclopedia. 14. New York: Robert Appleton Company.